I’ve learned how to plan my time while traveling, and I’m here to tell you about my experience. So you can learn from my mistakes. Here’s a complete guide on how you can manage your freelance workload while traveling. Experienced freelancers know that workload can sometimes be too hectic to handle. That’s why if you’re traveling, you need to plan everything ahead to avoid unpleasant surprises. Don’t leave anything to chance. The kind of mindset “It’ll work out somehow” isn’t something that will help you manage your freelance workload while traveling. Make sure that you’re prepared for the trip and you know exactly where you’ll stay and how much time a day you’ll be able to work. Book accommodation with Wi-Fi. Don’t let the excitement of a journey leave you careless. For a freelancer, having Wi-Fi connection is like breathing air. It’s essential. So make sure that you book an apartment or a hotel room with good Internet connection. Websites like Booking.com or Airbnb are great credible resources that provide travelers with apartments that have secured amenities, including Wi-Fi. Make to-do lists and reminders. It’s easy to get carried away while traveling. But as a freelancer, who’s basically always at work, you need to stay alert and keep in mind everything you need to do. Using tools like Evernote or Wunderlist that sink with all your devices will help you keep track of tasks and set reminders. Write everything down. Keep track of all the work you’ve done and plan on doing. You can either do it using your phone or get a simple journal and write everything down. It’s essential to have a reminder like that while traveling. Depending on how far you’re traveling, you can use the time to do some work. It’s a great way to kill spare time and spend it in a productive way. Besides, you’ll be able to save more time to enjoy the location you’re traveling to. It’s important to carry your laptop to every means of transportation you’re traveling by. But while most buses and trains have onboard Wi-Fi, some airlines do not offer this option. It’s a bit stressful for freelancers, who always have to be online. If you’re traveling by plane, you can choose an airline that has Wi-Fi access to make your journey as productive as possible. After all, why lose precious time, which you can spend later lying on a beach or visiting a museum? As a freelancer myself, I can tell you that most of us are governed by fear that we won’t have enough work to do to fend for ourselves. As a result, we tend to accept too much work or the work we simply can’t handle, thus spending most of the time working instead of enjoying the journey. This fear was the reason why I didn’t leave my apartment for 2 months while being in Norway. If you want to have time to enjoy your journey, you need to know when to stop, if your plate is already too full. My friend Cathy Davidson, a freelance writer at Trust My Paper, learned it the hard way when she took a job from a new client while visiting Rome for the first time and didn’t even make it to the Coliseum. Before managing your workload, understand the volume of it and be selective about accepting new offers. By doing workload analysis you’ll be able to properly manage your time while traveling. Work-life balance is a thing for freelancers too. But when you’re traveling, keeping your life in order somehow gets harder. It must be the pressure of adjusting to a new country that knocks us off balance. To cope with it, you need to keep up with a schedule religiously. Michelle Goodman, a freelance journalist from Seattle, in an interview with Business Insider, said that having a strict schedule and sticking to it will help you separate personal life from professional life. I couldn’t agree more. This statement works great for working while traveling as well. Analyze the volume of your workload, create a schedule and keep up with it. This will help you manage your work and remain stress-free while traveling. If you still have an overwhelming workload, you can try outsourcing some tasks by hiring an assistant or another freelancer to help you out. Can you afford to outsource? If you’re a beginner, you probably don’t have enough funds to hire someone to help you. Besides, traveling requires great financial input, so make sure that you have a budget big enough to both travel and have someone working for you. Can you trust another person? It’s a difficult question to consider. Unless you know someone you can trust, outsourcing your work to a complete stranger is potential damage to your reputation. I would recommend being exceptionally attentive to the quality of work done by someone you’ve hired. Only this way you’ll guarantee that the quality is preserved. Outsourcing is a good strategy to manage your workload while traveling, though it’s a bit risky. Make sure you weigh all the pros and cons before you take a decision. As a person who had major time management problems but learned the skill, I can tell you that it’s quite possible, as long as you remain truly committed and confident. Being able to travel at any time is one of the great perks freelancers have, and it would be foolish not to take advantage of it. 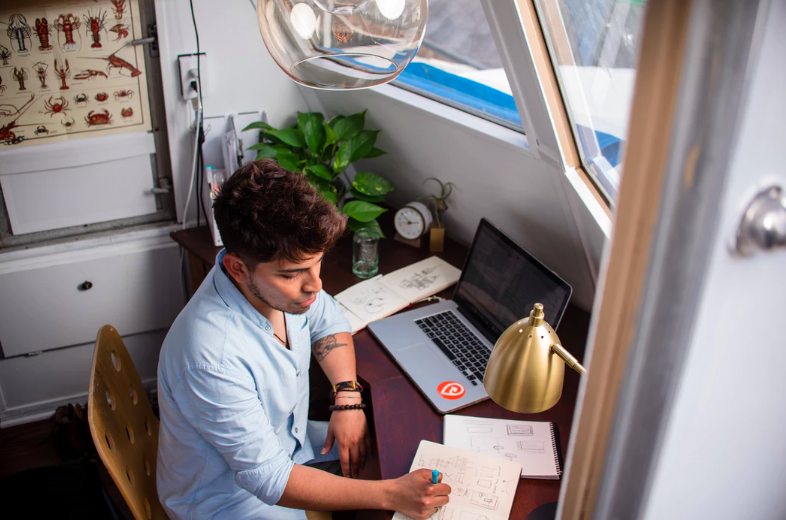 By following this guide you’ll be able to successfully manage your freelance workload while traveling and enjoy your time exploring the world.